One more transgender woman killed by her boyfriend, Spogmai murdered. Investigation was under way on Monday over killing of a transgender person reportedly at the hands of a man she was living with. 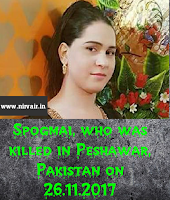 According to Gulberg SP Waseem Riaz, the transgender person, Spogmai, was shot and injured Sunday (26 Nov 2017) morning. He added the incident took place in Khyber Super Market area of Gulberg in Peshawar. The accused, Wassiullah, fired five shots with a 9mm pistol at Spogmai which left her critically injured. She was taken to the hospital where she succumbed to the wounds, police said. Since the area is a busy one, people heard gunshots and even saw the armed accused running away, the police official said. However, no one stepped forward to catch the murderer, he added. Spogmai was living with the accused who was running an arms business in Peshawar, as per the police. Police raided his shop and house in Banamarhi but had not caught him till this report was filed. However, CCTV footages have been obtained that show the accused. Main reason behind the incident has not been ascertained yet. But an FIR was filed in the case by Spogmai’s family that went to Lady Reading Hospital in the city to claim her body.